The opportunity to explore my work at a national conference was a dream come true, and I appreciate all of the helping hands that contributed in getting me there! 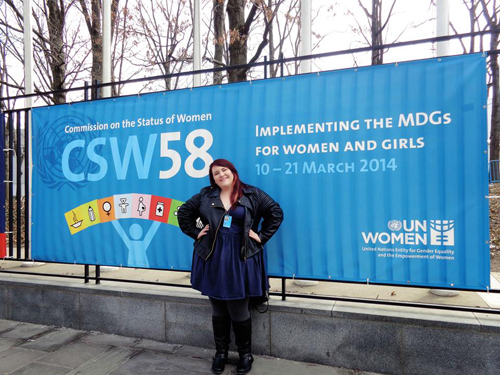 I hope this gives you the bigger picture of how I spent my time at the United Nations and gives you some insight into what my interests in the empowerment of women! Alright…Here we go! Where do I even begin? So many aspects of this trip were firsts for me. First time traveling long-distance on my own, first time taking a train, first time spending a week in NYC, first time at the United Nations! While the conference lasted for a total of two weeks, and I originally intended to stay that long, the overwhelming price of New York City Livin’ and some personal responsibilities in need of my attention back home only allowed me to attend for the first week. BUT NEVER FEAR! I made sure that I packed as much as I could into the week that I was there – and let me tell you, it was a lot! I came into this experience believing that the learning I would be doing for the week would only be through the Commission on the Status of Women, but it was so much more than that. Apart from the amazing events I was able to attend, I also talked to women around the world about their individual lives outside of the conference and what kinds of changes they wish to make in their own countries. These conversations ranged from talking to a Portuguese woman about her wallet made of cork (fun fact: 50% of the world’s cork supply is harvested from Portugal) to a Swedish woman whose passion lies in educating boys and men about women’s empowerment, because she believes that they have a major role in making change as well. My week really began on Tuesday, because the majority of Monday involved registering for the conference (which took hours, because of some confusion in where everyone was supposed to be) and learning where all the different events would be held. By the time I was finally registered, the events I most wanted to attend were over. So instead, I sat in an “overflow room” and watched the end of a broadcast of the General Assembly meeting that was currently taking place a few rooms down. This was an opportunity for each representative country to talk briefly about how they have implemented the Millennium Development Goals in their countries. It was truly inspiring seeing so many people from different cultures coming together for a common goal. With the setbacks of Monday fresh on my mind, I was determined to make Tuesday a very active day. I researched & planned out the best way to travel from my hostel (in Brooklyn) to the United Nations (in Manhattan) and found that with a little courage and a vague memorization of several maps, I was actually able to find my way around quite easily. The first task of the day was to meet up with the other delegates who were also sent to the UN by SustainUS, a non-profit that empowers youth by sending them to national conferences. 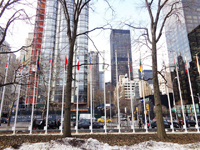 We all met in the North Lawn building of the UN, which is overflowing with paintings and sculptures. After our meeting, we were fortunate enough to be able to attend a meeting with the United States Mission to the United Nations with Peggy Kerry from the state department. This event served as a quick briefing for US NGOs (United States Non-Government Organizations) and as a question and answer session for those present. Some of the questions asked were about Gender-Based Violence, LGBT Issues, Women’s HealthStatistics, and CEDAW (the Convention to Eliminate all forms of Discrimination Against Women). Although the event didn’t serve as an all-encompassing look into the Mission’s specific policies surrounding those issues, it was still an enlightening session. Ambassador Russell, one of the panel members, said that she was most interested in issues of gender-based violence, women’s economic empowerment, and the education of adolescent girls, while Ambassador Cousens said “Women don’t simply need to be recipients of positive change, they need to be agents of positive change.” This quote stuck with me throughout the entire week, and I would often go back to think about how the conversations we were having at the UN could be turned into opportunities for action. I knew going into this experience that getting other women involved in changing their world was of utmost importance, but afterward, it was even further solidified for me. On Wednesday, I was able to attend two events that are very near and dear to my heart. The first was on Women’s Mental Health. In this session, we talked about the ways in which women with mental illness are stigmatized, which can hinder us from becoming self-actualized individuals. Mainstream societal narratives describe all women as inherently crazy by saying that emotions are illogical and need to be contained, and that women just can’t help but be at least a little insane. The problem this presents us with is that women who have actual mental illnesses aren’t taken seriously, and we are written off as lazy or stupid. The truth is, women are 70% more likely than men to experience depression, and because women have less institutional power than men, we are less likely to be able to have control over socioeconomic factors that can (and do) contribute to mental illness, making mental illness and disenfranchisement a cyclical process. To solve this issue and to get closer to achieving gender equality, we must destroy the stigma around mental illnesses, while offering more comprehensive access to the healthcare needed to address mental illnesses. When someone is the victim of cancer, society doesn’t tell them to shake it off or “try harder to feel better” as a solution, so why is that the answer we give to those who are mentally ill? When we are able to recognize that mental illness is real and detrimental, and that it doesn’t make someone less worthy of care and compassion, then we will be one step closer to ensuring that women’s issues surrounding mental health are given the attention and concern that they deserve. The second event was about Black Women & Women of Color and their role in achieving Gender Equality, despite the existence of racism and patriarchy. In this session, the fact was stressed that many policies put in place to advance the position of women in society don’t specifically and intentionally take into account women’s race, ethnicity, or cultural values. As a result, these policies become quickly whitewashed, and only serve to advance the position of white women, because they are unable to take into account the complexity of the issues that affect Black women and Women of Color. The solution proposed by this panel was that policies under CEDAW (the Convention to Eliminate all forms of Discrimination Against Women) need to be ever more specific, and need to take into account the racial, ethnic, and cultural variables that affect women all over the world. In other words, in aiming to create a universal policy that will help to protect the rights and interests of women, we must make absolutely certain that this policy is, in fact, universal, and can cover the many, many intricate and varying experiences of women all over the world. Something to keep in mind is that white people are often considered the majority, but there are more non-white people/people of color in the world than are white people, and their needs must be met as well. The event I was most excited for on Thursday was about how we can use the internet as a tool for women’s empowerment and social change. This is a topic that is very important to me, because my interests in women’s empowerment and social justice were cultivated through blogging. I was able to find communities of women who I could identify with, and I was able to share my experiences and learn about myself and others through the telling of our stories. Blogging helped encourage me to be proud of who I am, where I come from, and where I’m going. It also helped me to further explore my interests in photography, specifically my interest in exploring my multiple identities through photography and other forms of art. This session was powerful for me, because it helped to remind me that the internet can be an incredible outreach tool. This email is a perfect example! The internet allows us to connect with people from all over the world so that we can share our experiences and work together to build something beautiful. I think the internet is especially powerful where women are concerned because younger and younger women and girls are finding feminist communities where they can feel respected, listened to, and they can contribute ideas in a safe space. Online feminist communities are smashing the idea that feminism was something of the 70’s, and is showing that there is still a movement today, but that it’s even more complicated and far-reaching than before. And I don’t know about you, but that is seriously exciting to me! It means that the opportunity to truly work together and integrate a vast array of experiences in an effort to change the world is just a mouse-click away. It’s seriously, seriously cool. Friday was a day of reflection for me. After having taken in an absolute wealth of information from the week, a debrief was very needed! Attending the events was a wonderful experience, but the personal conversations I had with other women outside of the events seemed even more uplifting than the events themselves. There is something so special about getting on the same level as another person, learning their story, and hearing about their dreams that makes the work I do seem so necessary, valued, and mirrored in their own lives in different ways. As much as I love the academic side of social justice work, the most important aspect of it for me has always been the people. I was never quite sure of “what I wanted to be when I grew up” but I always knew it had to be something to do with helping people in whatever way possible. It was overwhelming to look out across a crowded room and see thousands of people from different countries all gathered in the same place to meet a common goal: to make the world a better place. 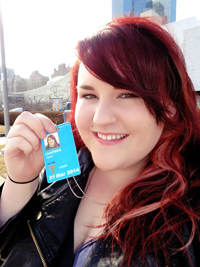 Being able to attend presentations at the United Nations was a dream come true, but the bigger dream was getting back to where I want to be: connecting with other people and envisioning a world in which people’s basic needs are being met, their lives are full of joy, and compassion doesn’t take the back seat in people’s priorities. This week was saturated with learning experiences, but the most important one of all was knowing that the work I do is important now, and that if we don’t do it, no one will – it’s clear that we are doing the work, and that gives me extraordinary hope.